Creativity isn’t the province simply of the so-called “creatives” in product development and marketing. Rather, the ability to be innovative in all the things a business does is critical to success in today’s economy. 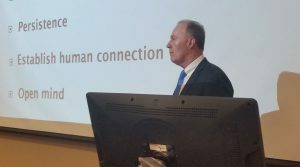 That’s the advice of Jamie Gallagher, president and CEO of drawing and writing product-maker Faber-Castell USA, who shared his wisdom with Eli Broad College of Business Full-Time MBA students on Wednesday, Aug. 22. Faber-Castell is one of the world’s oldest industrial companies, having survived many evolutions in how people write and draw since its founding in 1761. “If I step back and look at what really drives creativity in business today, what makes the difference in those companies that aren’t just creative in terms of their creative output, but also in terms of their creative environment and how they’re solving problems creatively and how they’re coming up with new operating models creatively,” Gallagher said. Creativity doesn’t happen in a vacuum; for it to flourish, businesses must host open environments, founded upon trust, Gallagher said. “The more we trust each other, the more open we can be. The more open we can be, the more we can reach our creative potential and our creative thinking potential,” Gallagher said. Key to functioning in a creative environment are what Gallagher called the four C’s: communication, collaboration, creativity, and critical thinking. “This is really the foundation of what you need,” he said. “If you can communicate, if you can think critically, if you can collaborate with others and you can be creative, you’ve got a tremendous foundation not just for professional success, but I think also in terms of good citizenship as well. Creativity will also help leaders weather a volatile, uncertain future.